Raven Jones. Photo courtesy of Raven Jones and Liberation Prison Project. Raven Jones holds the unique distinction of being the only FPMT Masters Program student to complete the intensive six-year study component of the program entirely from prison. He’s already begun a one-year retreat. He is currently a prisoner at Idaho Correctional Institution Orofino (ICIO) in the United States. 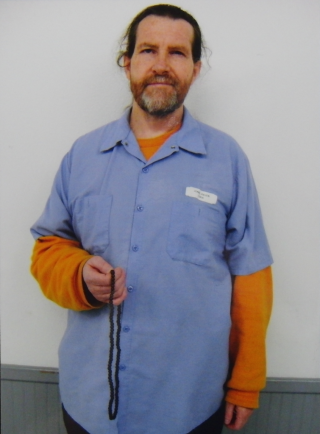 Tim Burress, a Liberation Prison Project Dharma friend, helped Mandala with this interview. Mandala: How did the opportunity arise to take the Masters Program (MP) and why did you decide to take it? Raven Jones: In 2004, I started corresponding with the Liberation Prison Project (LPP) and Ven. Robina Courtin, who put me in touch with an LPP Dharma friend, Tim Burress. Over the next year, LPP provided me with several modules of the Discovering Buddhism series, then I worked through the Basic Program with Tim. Continuing with my goals, Ven. Robina Courtin gave me refuge and individual liberation vows in 2005, and bodhisattva vows in 2007. Tim continued providing information and constant feedback to me, and in January 2008, told me I was being considered for the upcoming Masters Program, which I said would be great! In February, I received a letter from Ven. Sangye Khadro saying that she would be doing the Masters Program, had volunteered to help one inmate, and that LPP had assigned me to her! I was beyond words.